This English Lessons is a part of our English speaking course in Mumbai. At our English speaking classes in Mumbai and Thane we offer a variety of English classes for each level of English. Our Spoken English course consists of four aspects of learning English – Speaking, Reading, Listening and Writing. How are you? This is the most common question asked to offer Greetings in English OR Asked when you meet someone for the first time. It’s the fist question any one would ask to start a conversation. Don’t you think it’s dull and boring? Learn 10 Stylish ways to greet people or offer greetings in English. These English phrases would help you greet people in a creative way and showcase that you have a good knowledge of the English language and speak English fluently and confidently. Don’t make the mistake of asking these questions at a Job Interview. This English speaking practice lesson with Meera covers some slang , formal, informal and fun ways to greet someone in English. 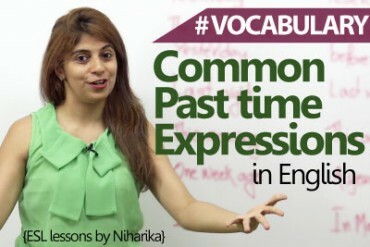 We hope you would enjoy today’s English lesson, to learn English with Meera and access more such interesting videos, click on the links mentioned below. Hey everybody, welcome back to Let’s Talk. This is me Meera your trainer for the day. Well today I have got something for you which is here for a reason, I’ll tell you why. A few days ago we did a lesson where we spoke about and we understood how to answer, “How are you?” in different ways. So instead of saying, “I’m fine, thank you.” what all can you say and thank you to all of you I got a great love and great support for the video and I went through your comments, so don’t blame me that I don’t. This video and this topic was highly requested on that video which is basically how to ask, “How are you?” in different ways. In case if you haven’t seen that video there will be a link somewhere right up here so you can go through that but let’s see what is in store for today. Without further ado let’s begin, alright, so different ways to ask and say, “How are you?” of course a term that we use and a question that we use on a daily basis but there are times when we’re in a great mood and we need to ask it in a very different way, in a quirky way probably being naughty or being fun, being informal with a friend and that is why you can ask it in so many different ways can you believe it? Well let’s get started, okay the first one is, “Hola! What’s new?” now you would say if I’m saying hola, why is there an H there when H is silent and hola is basically a Spanish word to say, “Hey” or “Hi”. So you can start with “Hola! What’s new?” I’ll tell you what, I really, really, really like and adore people who can speak in different languages. Maybe you cannot speak different languages but you can always learn new words such as ‘hi’, ‘how are you?’, ‘thank you’, ‘I’m sorry’ or maybe ‘have a good day’ and you can actually use it in your daily life. “Hola! What’s new?” that means I’m asking you, “Hey! What’s new with you?” and you would be equally excited to answer instead of me just asking you, “Hey! How are you?” “Hola! What’s new?” is so much more exciting, right? Well quickly moving on to the next one, “Howdy-doody?” now this particular question is a very cowboyish way to ask someone “How are you?” and of course it’s informal but it’s fine to be informal sometimes. Well you can use it with your friends and your family, right? Well you can type it in a message or record a voice message and send it to someone ‘howdy-doody’ is basically nothing but, “how are you doing?” right? And it’s a little short, sweet and so much more fun to answer ‘howdy-doody’ right? Okay, moving on to “what on earth are you up to?” Don’t you have friends who suddenly vanish out of nowhere? One day you’re just messaging them, one day you’re like let’s make a plan, let’s go for coffee and they’re gone for a week, right? And you’re thinking to yourself ‘what on earth is this person up to?’ Well there you go, that’s how you can ask someone ‘how are you doing?’ when you can directly ask them ‘what on earth are you up to?’ which means tell me what have you been doing and what is happening with you that you suddenly vanished in the air, right? That’s another way to ask ‘how are you?’ in general, right? Moving on ‘what new ideas are giving you energy?’ Well now this one can also be a very formal in a formal conversation as well as informal conversation. It’s a different, you’re just being creative, even in a formal environment where, ‘what new ideas are giving you energy?’ Don’t you have people in your office and probably in your college who are really hard-working? People and are always smiling and they’re there’s something on their mind, right? So these are the people, these are the people you can always ask, “Hey what ideas are giving you energy?” Like why are you so energetic all the time? That there’s definitely an idea in his or her head that’s giving them that energy. So go ahead guys, ask people who are that energetic that, ‘hey what new ideas are giving you so much energy?’ So people could say you know what, “I started this great workout.” You know what I’ve started this Zumba class. Do you know what I’ve started a new business, right? So a great and creative question will always give you an amazing and much more creative answer. So go ahead and ask someone this question. Well moving on, ‘Bonjour Nancy, good to see you’ well now you will ask me why is there no question mark out there? But guess what, ‘Bonjour’ itself, now this is another French word like I said I really love using different languages when I talk to people and I take, I take a lot of effort in learning. Well ‘Bonjour’ means ‘hi’ or ‘hello’ in French. Well this was Spanish and this is French and Nancy is a name, okay? So when you ask Bonjour you’re basically asking and saying, ‘hi! How are you?’ and you’re adding the word Nancy to it and then you’re just pleasantly smiling and saying, “good to see you Nancy” and it is such a sweet way of greeting someone. Now again this can also be formal, using a different language at a workplace is not that big a problem. So go ahead and use different languages in your conversations of course something that is much more commonly used and understood. Okay, moving on to “what’s cookin’ good looking” I know, I know you are saying that hey, that’s not correct grammar the spelling is not complete as well but guess what you don’t always have to be formally asking anyone ‘how are you doing?’ and that is exactly what this lesson is for, right? I know, so “what’s cookin’ good looking” is a very, very stylish, a very informal way of talking to your friends and asking your friends and family of what’s happening well sometimes you can also mean it when you probably have a crush on someone but other than that you’re asking someone what’s cookin as in what’s happening okay? So “what’s cookin?” as in “what’s happening?” and good looking is nothing but a sweet compliment which, which anyone would feel good about, right? So go ahead and ask someone at a party or probably your college but remember to be very, very subtle. Don’t be all creepy and ask someone, “What’s cookin, good looking?” you might just get slapped, don’t do that, right? So be nice and you this question only when you ask it with a nice smile and moving on from here we have “what are you up to these days?” Well this is very simple a very basic question but when you ask this question some people might feel that you’re actually interested in knowing something from them and you’re not just asking for the sake of it, for the heck of it and sometimes it is more believable, when you ask “what are you up to these days?” right? So they can tell you, so right from their work to probably their personal lives they can share so much with you, right? So you can always ask, “What are you up to these days?” which means they will end up answering about their lives maybe the movies that they have seen, maybe a hotel that they recently visited and had food and then you can continue the conversation from there on, okay? Quickly moving on, “what’s the excitement about?” again you are going to find hyper energetic and hyper excited people around you and they could be your friends or your acquaintances, right? So you can always ask them, “Hey, what’s the excitement about?” You know why, that means why are you so happy? What’s the smile about? Why are you so sparkling and why are you so jumping around everywhere? Well they would end up telling you properly that you know what, “I’m so excited for this movie” it could be as simple as that or it could be that they’re going on a trip very soon or maybe Christmas is coming or maybe winter is coming the excitement could be for anything but when you ask a creative question you get a creative answer and that’s why you can ask this question guys. Quickly moving on, “why the glow? Well, you can add a lot of adjectives to this word so you can ask, ‘why the glow?’ ‘Why the smile?’ ‘Why the smirk?’ ‘Why the face?, right? So isn’t that a short form what you use in your WhatsApp messages? But ‘why the glow’ as in you could actually find some people smiling for no reason sometimes or just being happy for no reason. It could be anything I mean, for real they could be in love. But you can always be the sweet person and ask them, ‘why the glow?’ So it could be anything, right? What do you think, why do you glow sometimes? Just because you’re smiling, right? So you can always replace the word glow with smile or smile with glow and you can make your boring question so much more interesting by just asking it in such a short and a simple way. Well moving on from there we have the last line for today and the last question for today which is, ‘looks like a good tan where have you been?’ so again another grammatical way of asking where have, where plus have, ‘where have you been’ a good tan is basically a different color on skin, right? Usually when do people get a tan? People get a tan when they go and they’re probably relaxing on a beach one day or for two days and they have a nice tan on their skin I really liked a tan skin to you? Well you can ask someone whenever you see your tan that, “hey I can see your tan I’m sure you have been relaxing on a beach on a weekend.” “So how was your weekend?” this is what you actually want to ask, right? But you can ask it in a very different fashion which means, ‘looks like a good tan’ probably you can wink if that person is your good friend not if that person is not your friend because that would be creepy and “Where have you been?” and then you would get to know that have they been on to a beach? Have they been relaxing? And what has been happening and just like that you can start a great conversation where you can share how was your weekend as well, right? So this is my lesson on how to ask, “How are you?” in different ways just so that the conversation is more exciting and so much more creative. Now if you guys have liked any of the any of this, go ahead and comment below I would be watching your comments and looking at your comments. Well that’s all for today guys make sure that you practice keep smiling spread a lot of love this is me Meera signing off for the day guys, ciao! 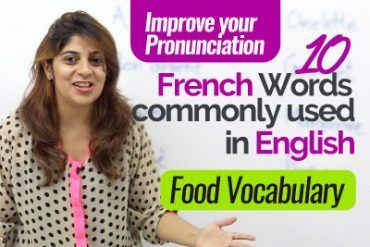 French Loan Words in English related to food.